"It's easy to buy a cooked hen, take the meat off the bone and use it in a 'wow' recipe. 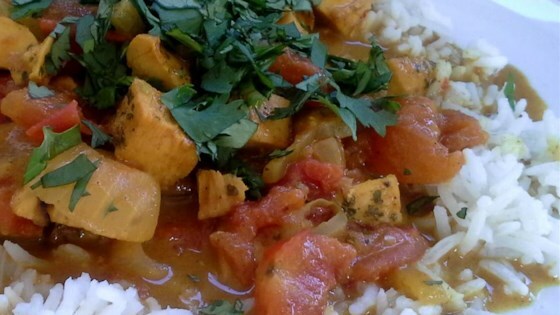 I especially like it for dishes like this curry that I might not have time to make from scratch." Mix spices in small bowl. Heat oil in a Dutch oven or small soup kettle over medium-high heat; add onion and saute until golden, 8 to 10 minutes. Add garlic; saute until fragrant, about 30 seconds. Add spices; toast until fragrant, 30 seconds to 1 minute. Add chicken; stir until completely coated with spices. Add coconut milk, tomatoes and broth. Bring to a simmer; cook uncovered until flavors blend and stew is thick, about 20 minutes. Remove from heat, sprinkle with cilantro and serve over rice. Pass chutney separately. My family loved this recipe. I doubled the amount of curry and added shredded carrots and sliced zucchini, as well as eliminating the tomatoes. Very versatile, great one dish meal. i was looking for a bit of a change from the chicken curry i usually make. this proved to be really delicious and i also threw in a diced chili for some heat. Very, very good. I followed the recipe to a T....only added the cilantro to the dish while cooking. (I do this all the time....dried from Penzeys Spice Company). Thank you for sharing! This is very good for a curry, considering how easy it is to make. My husband loved it. It will be a standard. I used chicken breasts. It is a keeper. Yummy as directed. I do like a little more coconut sweetness. Perhaps I will drain the tomatoes next time. So good with noodles! First time using curry. I wanted a change from the norm.I didn't do the "to serve" part. Served with mashed potatoes to soak up the sauce. My husband and I both liked it. This is a great recipe. It is really good with basmanti rice. Very good and surprisingly easy!